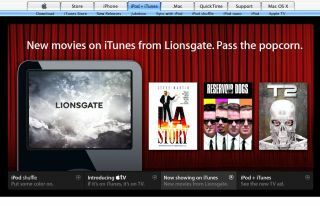 Lionsgate films will soon be available on iTunes US, under a new deal the independent studio has signed with Apple . The deal will make films such as Terminator 2, Dirty Dancing, The Blair Witch Project and LA Story, amongst others, available to American iTunes customers. "We're delighted to offer these incredibly popular Lionsgate films on iTunes, and look forward to adding even more films in the future," said Steve Beeks, president of Lionsgate. Effective from today, it marks another small victory for iTunes - Apple has failed to woo any of the big name studios to sell films on the online media store. As well as Lionsgate titles, iTunes also sells Disney films, plus films and TV shows from Disney subsidiary companies, such as Buena Vista. Films downloaded from the iTunes store are playable on iTunes itself, on a Mac, across Apple TV and on video-capable iPods , but nothing else. This is due to Apple's Fairplay policy which restricts the use of iTunes media to Apple-approved devices. Apple is rumoured to be making its film content available to European iTunes users later this year.